This Gamma 4 head gives you 4 flow rates. You no longer need separate heads for your seat, Step and bottom. Very easy to adjust without pools. 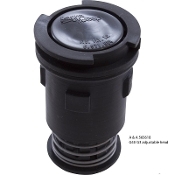 The G3 head is now replaced with this head, so you can use one head for steps, Seats, spas and bottoms. These are now adjustable.